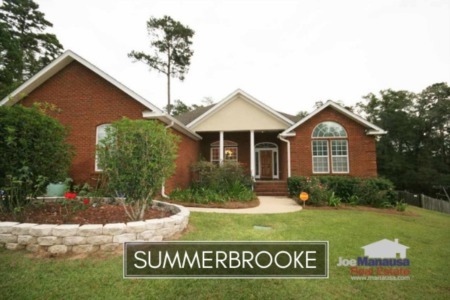 2015 was a solid year for home sales in Summerbrooke. Other than the big years from 1999 through 2006, last year was the best of the other 17 years, going back to 1991. 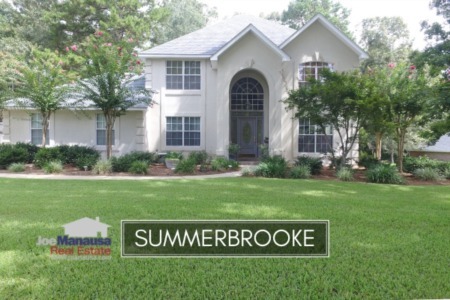 Summerbrooke is a popular NE Tallahassee golf course community which reports home sales each year at a level that typically results in it being among the top 15 neighborhoods in Leon County, Florida. Buyers continually tell us they favor the A rated schools here (Hawks Rise Elementary, Deerlake Middle School and Chiles High School), and they love owning executive style homes in an affordable golf course community situated within the heart of the popular 32312 zip code. In this report, we provide a long term graph of average home prices, home value trends, and home sizes in Summerbrooke, as well as all current listings in the Tallahassee MLS and all closed home sales going back to 1991. It is important to note that the narrative contained below is for sales through December for all previous years, but through January in 2016. The graphs and the closed sales table will be continuously updated into the future (meaning bookmark this page if you always want to know the current status of homes in the Summerbrooke). The average recorded home price for Summerbrooke in 2015 as $345,760, which was about 2% higher than what homebuyers paid on average the year prior. Low prices have been attracting buyers, and I expect to see continued growth in the number of houses that are being bought and sold here. Through the writing of this report, there has only been 1 closed home sales in Summerbrooke in 2016, and it was a doozie. We'll wait until we have a few more sales before we try to assess any sort of trend change. Average home values in Summerbrooke were the same in 2015 as they were in 2014. That means roughly three straight years with little value change ($126 per square foot in 2013, $125 per square foot for the next two years). The one sale in 2016 was valued at $107 per square foot, but this is likely due to it being a very large home for the neighborhood. Buyers, you have to know that values will not stay down forever. If you've been thinking about buying a home in a golf course community, this is an excellent time to find a great value in Summerbrooke. The average home size sold in Summerbrooke typically falls in a range of 2,600 to 3,200 square feet. The 43 home sales in 2015 averaged 2,758 square feet, meaning buyers were choosing homes below the middle of this range. The one sale thus far in 2016 was a whopping 5,351 square feet, which is nearly double the average home size for this neighborhood. Expect averages to be closer to what posted during the past few years once a few more sales come in. The following list shows more than 1,100 home sales in Summerbrooke going back to 1991. I hope you enjoyed our February 2016 update on home sales in Summerbrooke, please feel free to drop me a note if you have questions not covered in this report.